Creating greater efficiency for high to very-high volume laboratories, the AU2700Plus automates chemistry testing and provides extended walk-away time. Its outstanding performance in terms of quality, productivity, reliability and cost-efficiency demonstrates the capabilities that are unique to the AU systems family. This high-speed analyzer delivers true random access testing with up to 1600 photometric test results per hour (up to 2133 results with electrolytes) and up to 51 tests on board. 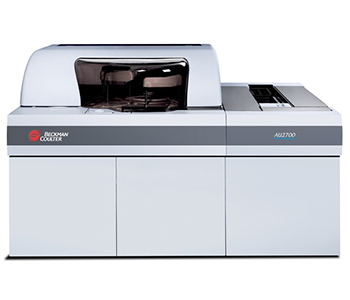 Consolidate with the AU broad test menu to deliver excellent efficiency. Dimensions (W x H x D): 79 x 39 x 33 in. need to get pricing of this analyzer. thanks you. Mr. Lee MT Laboratory Manager for Unified Laboratory Services. Kindly send me an quote for clinical chemistry analysers.